Tinnitus – commonly referred to as “ringing in the ears” affects hundreds of millions of people around the world. Yet it remains one of the least-understood medical conditions. Neuromonics, Inc., manufacturer and distributor of clinically proven tinnitus treatment devices, receives hundreds of questions each month from people seeking answers on tinnitus. Here, to help increase understanding and awareness of the condition, the company presents its top three questions it receives on tinnitus, with answers. Tinnitus is the condition often described as buzzing, ringing, hissing, humming, roaring, whistling or “ringing in the ears” that someone hears in the absence of any external sound. Globally, tinnitus affects an estimated 10-15 percent of the population. In the United States alone, more than 50 million people suffer from the condition, according to the American Tinnitus Association (ATA). About 16 million of them have severe enough tinnitus to seek medical attention. About two million patients are so seriously debilitated that they cannot function on a routine day-to-day basis. Usually brought on by exposure to loud noise, tinnitus is especially significant in the military, with more than 34 percent of returning veterans from Iraq and Afghanistan suffering from the condition. 2.Is there a cure for tinnitus? No cure yet exists for tinnitus, but sufferers can manage the condition by treating the underlying causes or by altering reactions to it. Thanks to research and development in the past decade, more effective treatments exist than ever before. The ATA, many universities and other organizations continue to advance research and development to identify a cure. Audiologists who specialize in tinnitus can most effectively diagnose and treat the condition. 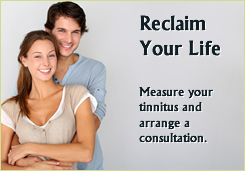 Sound therapy is one of the most promising developments in the treatment of tinnitus. Neuromonics, which manufactures and distributes clinically proven, FDA-cleared medical devices to treat tinnitus, uses calming, relaxing music in its devices. The music is embedded with a neural stimulus that interacts with the tinnitus perception, explains Eula Adams, CEO of Neuromonics. The music engages the auditory pathways to promote neural plastic changes. Over time, these changes help the brain to filter out the tinnitus perception, reducing tinnitus disturbance and providing long-term relief from symptoms. Neuromonics’ compact devices are simple to use, function much like familiar consumer music players, and fit easily into patients’ lifestyles. While the exact causes of tinnitus are hard to specify, many likely sources exist. All of them are known to trigger or worsen tinnitus. Noise exposure – The leading cause of tinnitus is prevalent in work and social situations. Whether attending a concert or using a power mower, individuals can significantly reduce risk of tinnitus by using ear protection. Head and neck trauma – Physical trauma to the head and neck can induce tinnitus. A recent Science Daily article even reported that NFL players can be at higher risk for tinnitus. Disorders – Disorders such as hypo- or hyperthyroidism, Meniere’s disease, Lyme disease, fibromyalgia, and thoracic outlet syndrome, can have tinnitus as a symptom. Ototoxicity – Some medications can be harmful or damaging to the ear, or produce tinnitus as a side effect without damaging the inner ear. Based in Westminster, Colo., Neuromonics, Inc., manufactures and distributes clinically proven, FDA-cleared medical devices to treat tinnitus. The patented and clinically proven Oasis, working the Neuromonics Tinnitus Treatment, provides long-term treatment and significant relief for those with severe tinnitus. The Haven, with the ability to program and individualize hearing profiles, is a management tool offering situational relief for tinnitus symptoms. The Sanctuary, also a management tool, works with pre-programmed profiles for on-demand relief.